This was an Aquarium media release distributed on December 30, 2014. In an already record setting year for cold-stunned sea turtles on Cape Cod, a 65-pound brown-shelled sea turtle emerged from the frigid surf of Great Island in Wellfleet Monday afternoon, just two days before New Year’s. Many New Englanders might be skeptical that sea turtles could be found in the region’s cold temperate waters even during the summer, much less than in the full blown grip of official winter! Two weeks had passed since the last live sea turtle had been found, and unofficially most everyone involved in this year’s tremendous six week long rescue effort was probably secretly grateful that it appeared over. Over the next fortnight, beach walkers occasionally found the carcasses of long dead sea turtles that were collected for later necropsy. Then four days after Christmas, the rescue staff of the Mass Audubon at Wellfleet Bay Sanctuary received word that a good-sized loggerhead had come ashore. The logical assumption was that this would be a body retrieval for later necropsy, but reports were that the animal was moving! Officially on well-earned time off, Mass Audubon staff responded to find a large, live loggerhead that was somewhat active. They quickly found a volunteer to drive the severely hypothermic marine reptile 90 miles to the New England Aquarium’s sea turtle hospital in Quincy, MA. Aquarium veterinarian, Dr. Kathy Tuxbury, found the turtle alive but extremely lethargic with a 44.9 degree body temperature and requiring respiratory aid. After blood work, she administered some life-saving drugs to the underweight but not emaciated turtle. The animal was quickly responsive to a variety of treatments. As of late Tuesday, the body temperature was steadily rebounding, and it was swimming for extended periods of time. The prognosis remains guarded, but nearly all signs are trending positively. Christmas miracle, plucky survivor against all odds or just the last turtle standing after an out-of-control summerlong crab feast, this now lively loggerhead had his 15 minutes of media time on New Year’s Eve. This yet to be named sea turtle is the 746th one admitted to the Aquarium’s animal care center this year. 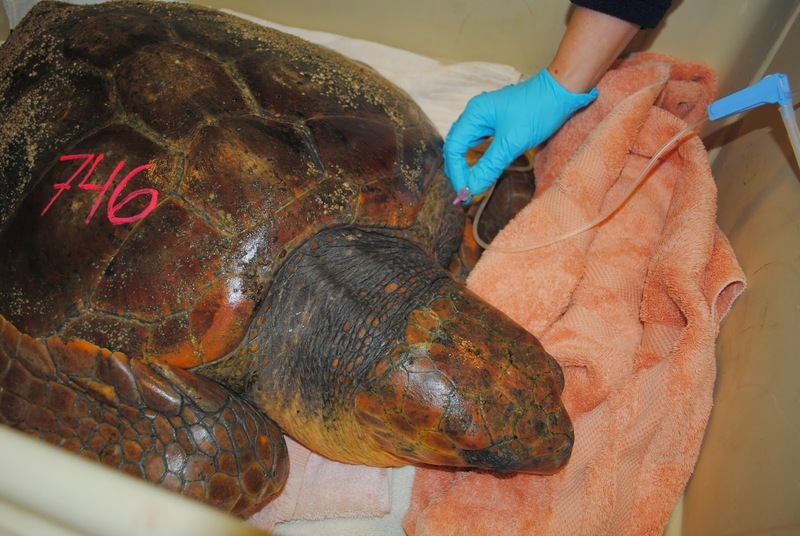 In an average year over the past decade, 90 hypothermic sea turtles are usually treated. As 2014 closes, the New England Aquarium would like to thank all of those who this past November and December helped to save hundreds of the world’s most endangered sea turtles. That includes our amazing, long term partner Mass Audubon, the hundreds of local volunteers who walked beaches or helped in our sea turtle hospital, the Coast Guard and the private pilots who airlifted turtles, NOAA– the federal oceans agency—and the dozens of marine animal rehab facilities in 16 states that either took re-warmed and stabilized sea turtles or sent professional staff to help care for all of the hypothermic sea turtles in this record smashing year. 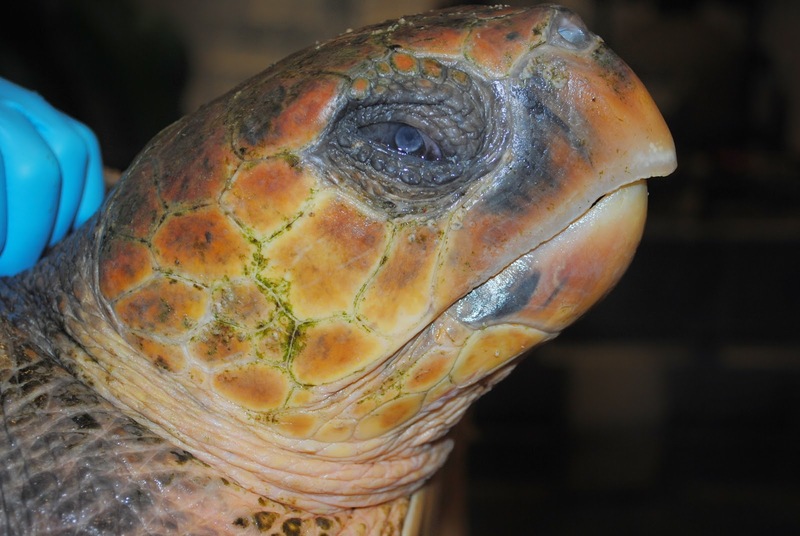 Our last loggerhead is also grateful as it welcomed in a new year.